some of them are just creepy. During a recent trip to Target with all three kids, we saw a huge toy monkey. It was on an endcap in a display case with a space left open so kids could come by, push the button, see and hear the monkey do its thing, and then beg their parents to buy it. Target is so smart that way. The boys were sitting together in a cart at the time, so I pulled up next to it and Aliza reached in and pushed the button. The boys looked on curiously. 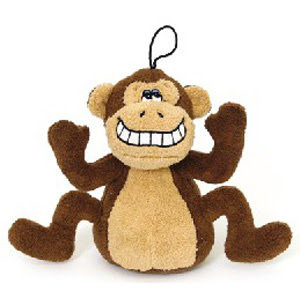 The monkey started swinging his big monkey arms up and down and emitted a squeaky, loud screeching noise. Pretty realistic, actually, and about as pleasant as you'd imagine a real monkey screech might be. What are toymakers thinking, by the way? The boys looked startled, and then started trying to escape from the cart to get away from the weird thing. Aliza and I tried not to giggle as I drove the cart away as quick as I could. They were upset, but their reaction was just so unexpected. Lesson learned: Boots the Monkey, good. Other strange monkeys making sounds, very very very bad. I wish I could have seen that! But the image you created for me was very funny nonetheless!